Nerium oleander is an example of a xeromorphic leaf . Examine the micrograph to the right, in conjunction with the line drawing below and note the invagination of the lower epidermis, to form a stomatal crypt. These crypts usually contain large numbers of trichomes as well as all of the stomata (shown as green ellipses in the diagram below). Stomata are required for gas exchange - water is lost during photosynthesis - during which O2 and CO2 are exchanged. Note the distribution and size of the veins. 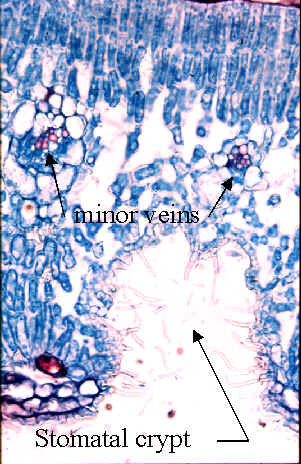 The micrograph to the right contains two minor veins (shown as green hashed areas in the diagram below). These are responsible for transporting solute (in a water base, via the phloem) and solvent (water, in the xylem).